Many older houses have quite tiny kitchens, and even kitchens in some modern homes are on the small side. If you have to cope with a small kitchen, then when you see those wonderful large kitchens in other people’s homes, in magazines and on the web it isn’t surprising that you are likely to want one yourself. 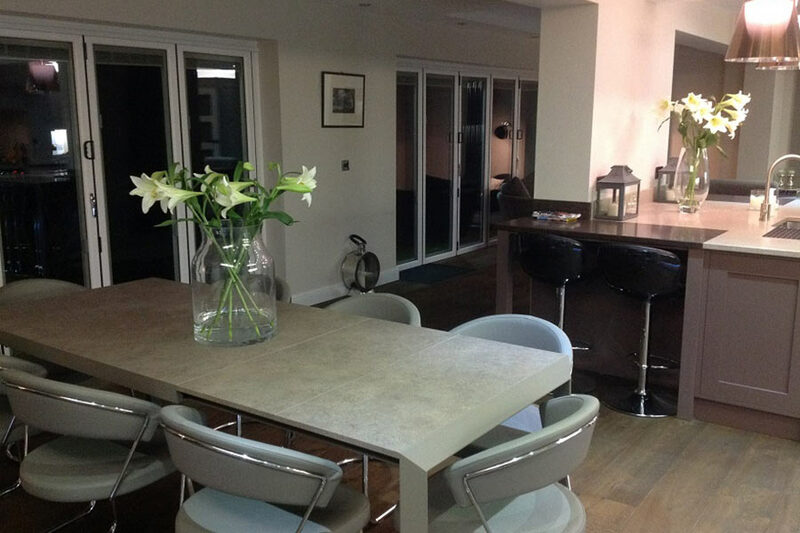 At Total Extensions we have fulfilled such dreams for many of our customers by creating beautiful large kitchens and kitchen extensions throughout Kent and Sussex. There are many different kinds of kitchen designs, but today most people choose a contemporary design rather than a more traditional one, though it really depends on which you prefer. Contemporary kitchens tend to be sleek uncluttered layouts with plenty of space and typically are furnished with luxury gloss or wood finishes along with all the latest high tech integrated kitchen appliances. Floor to ceiling cupboards are also very popular as are central island units. Whatever design you go for, it is likely that you will want a larger kitchen than your existing one, which means that you will need a kitchen extension. There are a number of different kinds of kitchen extensions. These are kitchen side extension, kitchen rear extension and kitchen wrap around kitchen extension. The kind that is best for you will depend on a number of factors including the amount of space you have around your home to extend into; the style of your property; planning regulations; your personal needs and requirements; and your budget. This is also called a side return extension as it extends into the outer walkway alongside your kitchen, and it is one of the most popular kitchen extensions in Kent and Sussex. Typically we would build out anything from around 1 ¼ metres to the side of your home extending along your house to the back, finishing in line with the back of your house. The roof could be either a flat roof or a pitched roof depending on the style of your home and your preferences. With a rear extension, just the end of your property is extended. We build a number of kitchen rear extensions in Kent and Sussex typically adding areas of around 5 metres by 3 meters to an existing kitchen depending on the specific size and layout. There are a number of roof options, for instance you could choose to have the kind of roof that we often build in our orangeries, which includes a roof lantern to let in lots of natural light. Alternatively you could choose a flat roof or a pitched roof. Generally a wrap round extension extends the kitchen while also adding additional living space to your home. It combines a rear extension into your back garden with a side return extension to create an “L” shaped extension. This is an excellent solution if you want to create an open plan living space; open plan wrap round kitchen extensions in Kent and Sussex are popular and we have built many beautiful ones. There are many different options to consider, for instance you might choose a flat roof or a pitched roof depending on the details of your existing building. If you would like a bigger better kitchen than your existing one, why not talk to us about it? We will be able to advise you on the options that are available to you and help you plan your dream kitchen, which will not only delight you and your family; it will also increase the value of your home.